Soon it will be Halloween. Time to go candy shopping for witches, ghosts and goblins. Our Lorne Park Dental Tooth Fairy will help you sort through the choices and give you tips to help your trick-or-treaters manage the sugar. When it comes to candy, chocolate is probably your best bet. Plain chocolate washes off your teeth easier than other types of candy. Dark chocolate also has less sugar than milk chocolate. Beware of chocolate with added chewy or gooey bits that stick to teeth. "Be picky if it's sticky." The longer candies stick to the teeth the more time it gives the cavity-causing bacteria to work. Chewy candies are the hardest to brush off the teeth, especially out of deep grooves on molars. When bubblegum is chewed, the teeth are given a sugar bath. 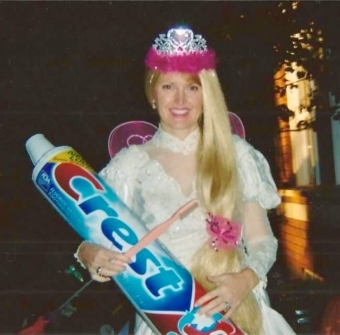 Our Tooth Fairy definitely suggests staying clear of sour candies, especially ones that are chewy and coated in sugar! They are very popular despite them being one of the scariest for the teeth. Sour candy can be very acidic. The acidity can weaken and damage the hard outer shell of your teeth, making your teeth more vulnerable to cavities. Sugar on the sour candies provides a feast for mouth bacteria. More cavity-causing mouth acids are produced making a sugar-coated sour candy a double-wammy trick for the teeth. Beware of hard candies. Biting into a hard candy may result in a chipped tooth. Sucking on hard candies prolongs the time that teeth are exposed to sugar which increases the risk of developing a cavity. According to the Tooth Fairy, these treats are a better choice. However, she reminds us that potato chips, cheesies and even those cute little fish-shaped crackers, all break down into carbohydrates/sugars. Extra effort is required when brushing them off the biting surfaces of the teeth. Why are Halloween treat choices important? The bacteria in our mouths love all that yummy sugar that will be coming their way at Halloween. They feed on the sugar and a weak acid is produced which can contribute to cavities. Saliva contains calcium and phosphate and together with fluoride, works against cavity causing mouth acids. Choosing a treat that clears from the mouth quickly and is less likely to form acids that cause cavities is the way to go! Helping your child sort through their Halloween trick-or-treat loot bag is always a good plan. Some families use a "Switch Witch" to trade out candies that are more likely to harm teeth with another type of treat, like a small toy or a book. Time it right. It's best to eat Halloween candy with a meal when the saliva is flowing to wash the sugars away. Limit snacking. Snacking on sugary treats doesn't give teeth a chance to recover from the cavity-causing effects of the mouth acids. Be sure to use a fluoride toothpaste and drink fluoridated water. Fluoride strengthens and remineralizes tooth enamel. Brush for two minutes and floss or somehow clean between the teeth after a Halloween treat. Even older children may need extra help with their oral care at Halloween time. When brushing, pay particular attention to the deep grooves on the molars in the back. Drink more water to help wash sugars away. Chewing gum or using sugarless mints with xylitol can help prevent cavities. Our Lorne Park Dental team in Mississauga loves Halloween treats too! Splurging at Halloween is ok. We hope our Tooth Fairy tips will help you choose treats that are the most tooth-friendly and will keep your trick-or-treaters smiling! Happy Halloween!